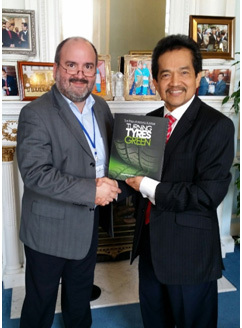 On his recent visit to TARRC, Prof Jorge Lacayo-Pineda, Head of Expert-Field Materials Evaluation at Continental Tires in Hannover received one of the first complimentary copies of a new book, The Role of Natural Rubber – Turning Tyres Green, recently published by the Malaysian Rubber Board, which includes work conducted at TARRC over the past sixty years. Prof Lacayo was visiting TARRC to discuss common areas of interest in the tyre field and potential topics for future collaboration. This follows TARRC’s successful visit to the Tire Technology 2016 EXPO and Conference in Hannover in February when as well as hosting an exhibition stand TARRC staff gave several conference presentations. These included presentations on TARRC’s current tyre research activities on the use of new Atomic Force Microscopy techniques for the evaluation of the dynamic characteristics of filled rubber compounds, the use of silane coupling agents for silica filled NR tread compounds and improved performance of CV pre-cured retread tyres using silica filled Ekoprena. Prof Lacayo has been employed by Continental AG since 1998 and took over position of Head of the Expert Field Material Evaluation in 2009. He is responsible for technical and scientific matters for Continental laboratories world­wide and represents Continental AG on scientific committees of international or­ganisations such as the International Standards Organisation (ISO), together with representatives from the Malaysian Rubber Board and TARRC, the European Tire & Rubber Manufacturers Association (ETRMA) and the Rubber Committee of the Ameri­can Society of Testing and Materials (ASTM). He was awarded honorary professorship of the Leibniz Universität Hannover in 2009.